SYDNEY – In a speech at the Center for Strategic and International Studies in Washington, DC, on February 22, Japanese Prime Minister Shinzo Abe informed the audience of officials, experts, and journalists that Japan is "back" and will not stand down in its ongoing sovereignty dispute with China over the Senkaku/Diaoyu Islands. With Chinese provocations on the rise, US President Barack Obama, Abe's host, appealed for calm and restraint on both sides. Japan is likely to accede – grudgingly – to America's request, as it remains dependent on its alliance with the US for its security. But it will be much more difficult to persuade China that it should stand down. China's assertiveness over its sovereignty claim reflects more than a desire to exploit seabed resources, or to gain a widened strategic gateway into the western Pacific. It is also about national renewal and rejuvenation – the core of the Chinese Communist Party's raison d'être. Turning away from a fight with its former occupier and historical rival would be a step backward in this six-decade-long quest. The idea of Chinese renewal or rejuvenation was popularized by then-Premier Zhao Ziyang in the late 1980's, and frequently promoted by Presidents Jiang Zemin and Hu Jintao. Most recently, incoming President Xi Jinping, visiting the National Museum of China's "Road Toward Renewal" exhibition, pledged to continue the "great renewal of the Chinese nation." What does "renewal" or "rejuvenation" mean to the Chinese? All nations – great and small – embody a combination of historical fact and myth. In this case, the CCP's view of rejuvenation is built on the belief that the zenith of Chinese power under the Ming and Qing dynasties represents the natural, just, and permanent state of affairs for a 5,000-year-old civilization. When Mao Zedong took power in 1949, his immediate goal was to re-establish the "greater China" of the Qing Dynasty (1644-1912), insisting that the Manchu-led empire was the permanent and enduring China. But, while the assault on the Qing Dynasty by foreign powers is a historical fact, the notion that there has been one enduring China struggling against avaricious outsiders across several millennia is false and self-serving. Mao achieved his goal following the so-called peaceful liberation of the East Turkestan Republic (now Xinjiang) in 1949 and the invasion of Tibet in 1950, which promptly increased China's size by more than one-third. And every CCP (Chinese Communist Party) leader since has carried forward his vision of a greater China, adjusting and expanding it as the country's power grows. For example, China showed little interest in the Senkaku/Diaoyu Islands prior to 1968 – the year a geographical study pointed to vast oil reserves beneath the seabed. The same can be said for China's growing stridency with respect to its claims in the South China Sea. 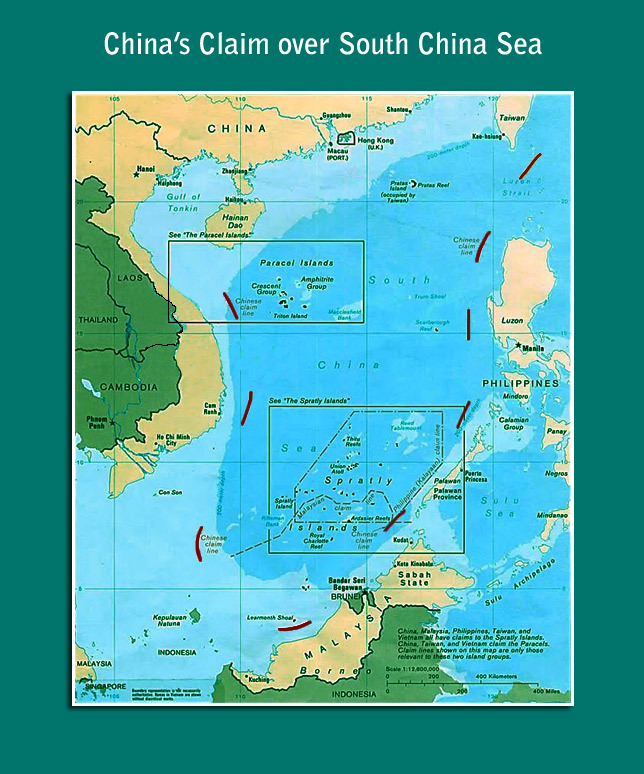 In 2009, relying heavily on a dubious historical claim, China formally tabled its "nine-dotted line" map to the United Nations Commission on the Limits of the Continental Shelf, and has since referred to almost all of the South China Sea as being under its "indisputable sovereignty." Having dominated East and Southeast Asia for all but the last two centuries of the past two millennia, China is chafing at the current US-led regional order of sovereign states, in which even the smallest enjoys the same rights, privileges, and protection as the largest. Modern China has benefited enormously from this arrangement; nonetheless, there is keen resentment that the Chinese civilization-state's vast achievements over several thousand years offer China no special status. To a people imbued with a deep sense of superior moral worth, historical achievement, and victimization by foreign powers, this state of affairs is unjust and unnatural. It follows that pulling back from any territorial dispute with smaller and inferior states would be seen as a humiliating defeat, rather than a step toward ensuring long-term regional stability. Moreover, an expanding view of greater China implies that a resolution of the dispute over the Senkaku/Diaoyu Islands in China's favor would be likely to embolden rather than satisfy its ambitions. Making good on its claim to the South China Sea could be next. As Obama and Abe forge a common strategy aimed at helping to manage China's rise peacefully, they must understand that China's conception of renewal seeks to resurrect a glorious past, and that this implies revision, not affirmation, of the existing regional order. This means that they will have to limit China's strategic and military options, even if they cannot constrain its ambitions.